New research strengthens claims that taking common painkillers at the time a vaccine injection may lessen its effectiveness and potentially cause problems with the immune system. Dr. Richard P. Phipps, of the University of Rochester Medical Center, released findings similar to a Czech study - namely that painkillers such as Advil, Tylenol and aspirin can blunt a vaccine's effectiveness. "What we've been saying all along, and continue to stress, is that it's probably not a good idea to take common, over-the-counter pain relievers for minor discomfort associated with vaccination," Phipps said in a statement. "We have studied this question using virus particles, live virus, and different kinds of pain relievers, in human blood samples and in mice - and all of our research shows that pain relievers interfere with the effect of the vaccine." 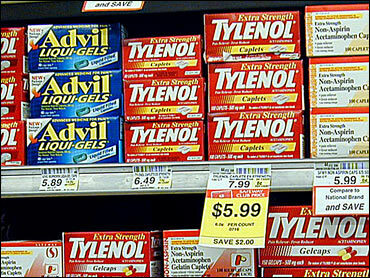 The Czech study found that acetaminophen, the active ingredient in Tylenol, weakened the immune response in infants during vaccination. According to the study, most pain relievers block the cox-2 enzyme, which can limit the vaccine's effectiveness. Meanwhile, a leading government health figure says tests on millions of people who have received the H1N1 flu vaccine shows that it's safe and effective. Dr. Anthony Fauci of the National Institute of Allergy and Infectious Diseases told CBS' "The Early Show" that people should . He pointed to a study of pregnant woman that more than 90 percent of the patients who got the vaccine mounted "a response that you would have predicted." Fauci said officials did a clinical trial and found that "a single, standard dose of H1N1 vaccine produces a standard response" in terms of building immunity. He said "there are very strong data to indicate the vaccination will protect you." However, children between 6 months and 9 years old should get two doses, Fauci said Monday.